Preface by Air Commodore S A Baldwin MBE. This year a small group of us yet again celebrated the anniversary of our efforts in support of the campaign to retake the Falklands Islands following the Argentine Forces invasion in April 1982. Through the success of the book commemorating the 1st Vulcan bombing raid on Port Stanley airfield, many are now aware of the exploits of the small team of RAF Waddington bomber crews who took part in Operation CORPORATE. Nicknamed "BLACK BUCK", the first 2 sorties were traditional medium level bombing raids using conventional weapons against the runway hard surfaces of Port Stanley. BLACK BUCK 3 was cancelled before the aircraft took off, due to the poor weather conditions en route to the Falkland Islands which made the prospect of a successful fuel transfer highly unlikely. BLACK BUCK 7 was flown to coincide with the final assault on Port Stanley by the liberating British troops on 12 June 1982. So what about BLACK BUCK 4,5 & 6? These diaries form part of the story of those forgotten sorties. On 30 January 2018, I was invited to the Argentine Embassy in London at the request of the Argentinian Defence Attaché, Group Captain Fernando Mengo. 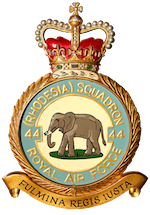 Group Captain Mengo had been approached by a retired Argentine Air Force Commodore, Miguel Angel Silva, and by Guillermo Saravia, a retired fighter controller of the Westinghouse TPS-43 squadron from the Falklands war of 1982. The 2 veterans were very keen to get in contact with me to have an exchange of views and memories of the 3 Black Buck missions tasked against Argentine radars using Shrike AGM-45 anti-radiation missiles. 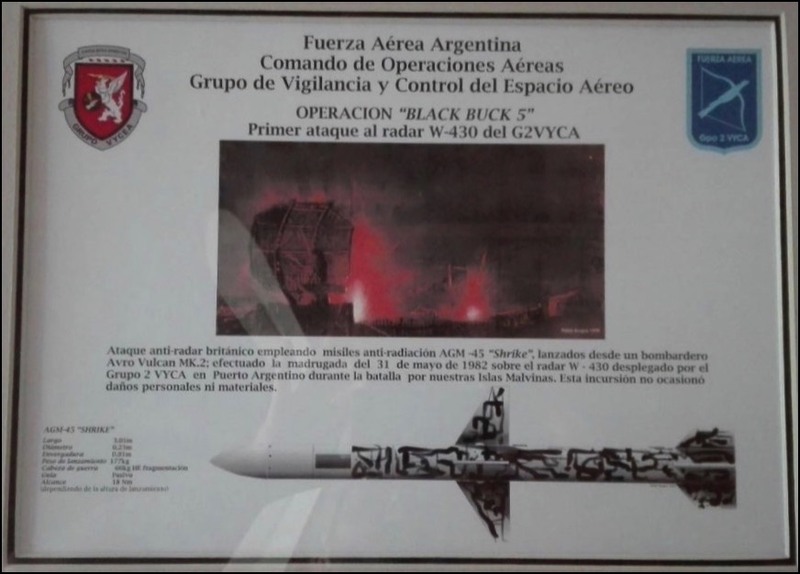 Since my meeting in London I have had an exchange of emails with Guillermo Saravia in Buenos Aires who was a young Lieutenant with Group 2 Air Surveillance and Control Squadron (G2VyCA) back in 1982. 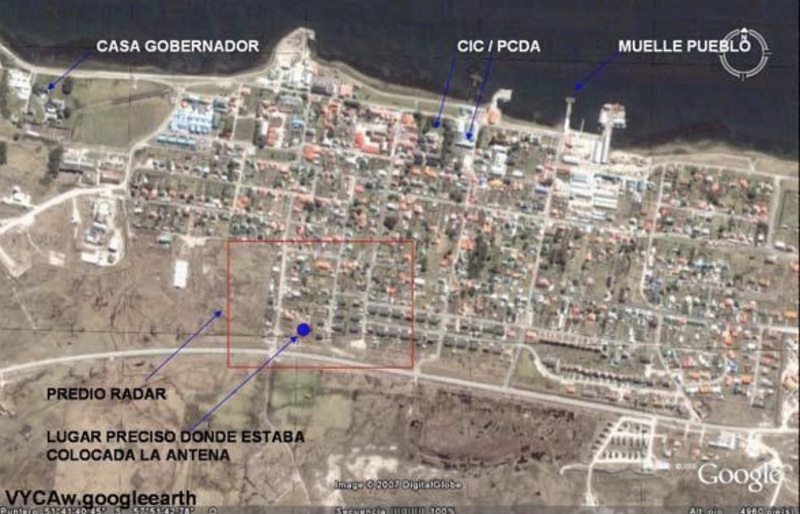 He has helped me to translate a section of the War Diary of G2VyCA, the Radar Malvinas, compiled and written by his old boss, Miguel Angel Silva. The ‘diario’ was written, naturally, in Spanish but with the assistance of 2 online applications and my own rudimentary Spanish, I have been able provide a translation of a section of the diary that relates to Black Bucks 4, 5 and 6. Much of the original transcript had been written in colloquial ‘Argentine Spanish’ and so I had to refer back to Guillermo on a number of occasions to ensure I had understood and grasped the correct meaning of the ‘local dialect’. I have tried to remain true to the original text without applying my own interpretation. As a result, some of the narrative reads a little awkward. I was very keen after all these years to hear the Argentine side of the story without any mis-representation. The only additions I have made to the text are by inserting the occasional word in brackets [....] to help the reader with the context of that particular sentence or where there may be some ambiguity as a result of the translation. Finally, a sketch and a number of photographs taken from the diary have been included to complement the narrative and assist the reader. [To set the scene this text commences with a translation of ‘Diario de Guerra del Radar Malvinas’ from Page 47 onwards. It describes where the TPS-43 was located on the outskirts of Port Stanley and outlines its concept of operations]. In the selected location there was a manger for animals, whose height coincided with that of the base of the antenna; behind this, looking from the sea, were located the antenna and the technicians’ cabin [cab technica]. They had to be located together such that both could not be seen from the sea, the only part protruding above the manger was the antenna itself, which was impossible to hide. 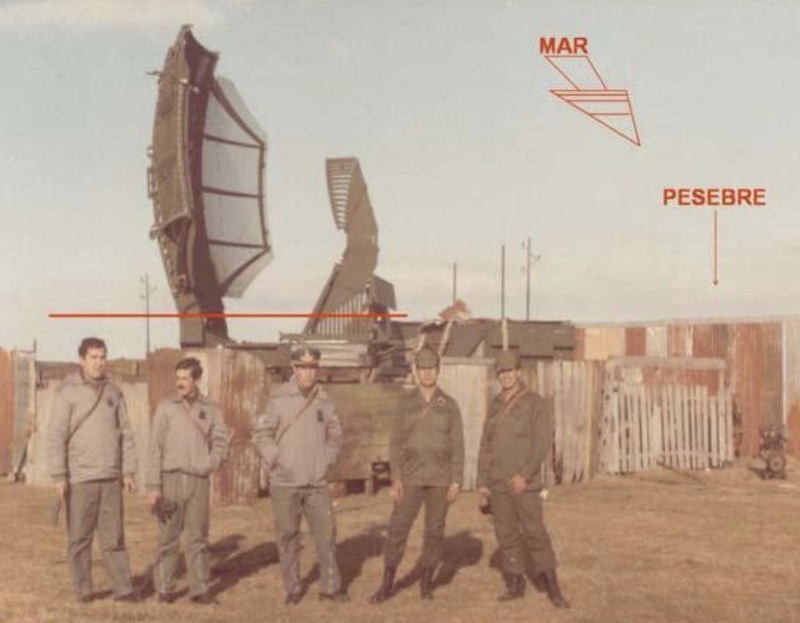 The operators’ cabin [cab operativa], within which they [controllers] would continue operating, no matter what happened, was positioned 70 meters and 5 centimetres away from the technicians’ cabin; it could not be located any further (the antenna would be the target) because the signal cables that join the technicians’ and operators’ cabins measured 70 metres; however, they managed to extend it by an extra 5 centimetres. As a result, the operators’ cabin was about 10 meters away from what would be the accommodation for the technicians and soldiers, about which we will talk later. Halfway between the two cabins they positioned the 2 generators and the fuel, next to one of the few trees on the islands. To fortify the operators’ cabin, they used the 200 litre drums that had been used to fuel the radar [generators], and some aluminium plates of approximately 5 x 1 metres, which were also used to extend runways or make aircraft platforms. The drums were cut off at the lid and filled with peat, and used to make a wall around the cabin, 3 drums wide by 3 tall. Resting on these drums and passing over the cabin they placed the track plates, and on top of these, another layer of drums. Also, the blue colour of the drums, plus the wooden fences and veneers, helped to disorient anyone who may have been trying to locate the radar. In this way the operations cabin was transformed into a bunker, giving those inside enough tranquility and the feeling of protection that we spoke about at the beginning. The confidence that this pseudo-bunker gave was so great that when the ships arrived at night to shell, some preferred to enter the cabin rather than the trenches that had been dug in front of the technicians’ and soldiers’ accommodation building. The TPS-43 and its pseudo fortifications. Control of our own air movements. The detection and localisation of naval surface targets (ships). The indirect location of places where terrestrial troops were located. Support for launching EXOCET land-sea missiles. A TPS-43 crew on ops at Port Stanley in 1982. [A translation from Page 148 onwards of ‘Diario de Guerra del Radar Malvinas’]. Earlier in the book we talked about one of the fighter controllers’ greatest obsessions: who was going to attack them and with what? It was going to be with Shrike missiles carried by Vulcan aircraft. completed to install the necessary wiring between the cockpit and a wing station for the control and launch of a missile. Now, from what we had already deduced at the beginning, we see that the fighter controllers had been quite successful in their assessments; they sensed the missile used would be the Shrike but they did not know what its carrier platform would be. Although the Vulcan had attacked the airport, the fighter controllers did not know that it had its stations wired, and therefore they continued to mull over how the missile would be carried, possibly by an American [platform]. There's a British writing that talks about a Harrier that had been wired to carry and fire the Shrike. This Harrier would have been one of the two RAF GR3s that arrived in the Malvinas area on 8 (or 10) June but we found no more details about it. Later in our story, you will see that there was a possibility that a Harrier had this capability flying on 12 June because of its behaviour and manoeuvres that seemed to be searching for a correct position from which to launch a Shrike at the radar. The Vulcan could launch the Shrike missile at 16 km from the radar. He needed a certain amount of time to confirm that he had the signal of a target (a radar) engaged (captured and directed) with his sensor, and this signal would have to be continuously engaged by the missile until, if all the systems aboard the missile worked well, made an impact. 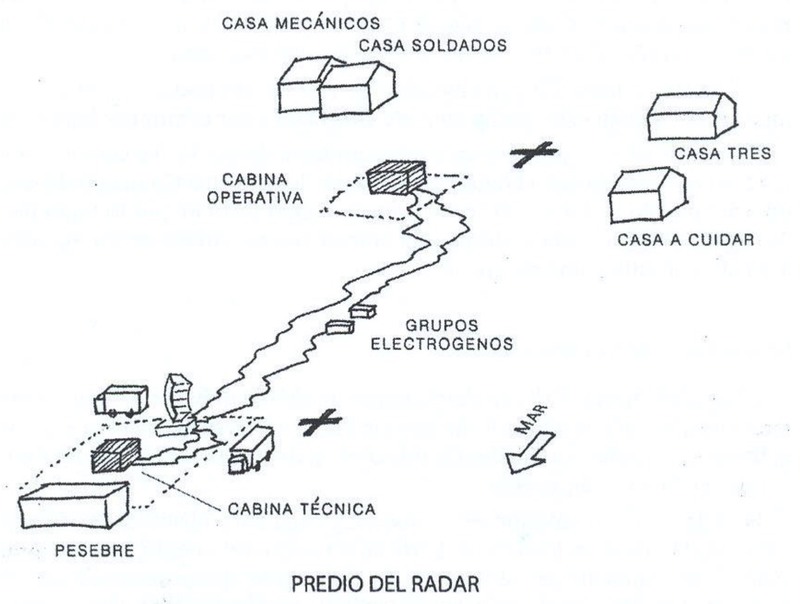 So the tactic would be: about 25 or 30 km from the radar, the aircraft would confront the radar and track straight towards it; the missile’s sensor would engage the radar signal and at 16 km, or less, would be fired; remaining locked onto the radar signal for reference it would continue its flight until after approximately one minute time of flight, [the missile] would impact the TPS-43. The missile would be launched outside the lethal envelope of the anti-aircraft artillery, so nothing could be done by the anti-aircraft artillery gunners to prevent the plane from launching the missile. Which meant that the confrontation would actually be radars versus missiles. The options in favour of the fighter controllers were: that the missile’s on-board systems would fail or operate badly so that it could not be launched, or it deviated; that the fortification made with the trucks of box metal did their job; or the missile was denied the radar signal it needed for guidance. The first option depended on the manufacture of the missile and chance. The second also depended on the missile deviating a little and impacting outside the ring of the pseudo-fortification rather than directly on the antenna. The only option available to the controllers was to deny the missile of a homing radar signal, and this is what they worked on. and the cutting of the radar signal. courage, to race against a missile; and so, the betting was now in favour of the radar. Although, as we will see, they did not fare well at the first opportunity. The fighter controllers made another mistake by not patenting their invention, which was then later offered as an option by Westinghouse, the TPS-43 factory, for the small cost of a few thousand dollars. From that moment on, every time a plane pointed directly at the radar and approached to within about 20 km, the operators, without moving from their chair, ‘cut high’, waited about 20 to 30 seconds, ‘gave high’, and verified where all the echoes on the screen were. If the 20 km return continued to advance they would ‘cut’ for 20 to 30 seconds; if it had turned on to another track, they would ‘leave high’, and so they kept switching it on and off until the probable threat had ceased. In this game of cat and mouse, you just had to wait and see who won. Sketch taken from the controller’s diary showing the disposition of TPS-43 equipment and impact points of two Shrike missiles (marked with an X). The British planned their first anti-radar mission, Black Buck 4, for 28 May but after 5 hours of flight they cancelled because they had problems with the refuelling system of one of the Victors. The second mission, Black Buck 5, commenced on May 30th at night with the launch of the Vulcan and Victors from Ascension, and at 0545 hrs on the 31st, two Shrike missiles shook the radar operators and the surroundings. So what happened? To be able to relate clearly the facts and detail of the attack, we must consider the previous situation. 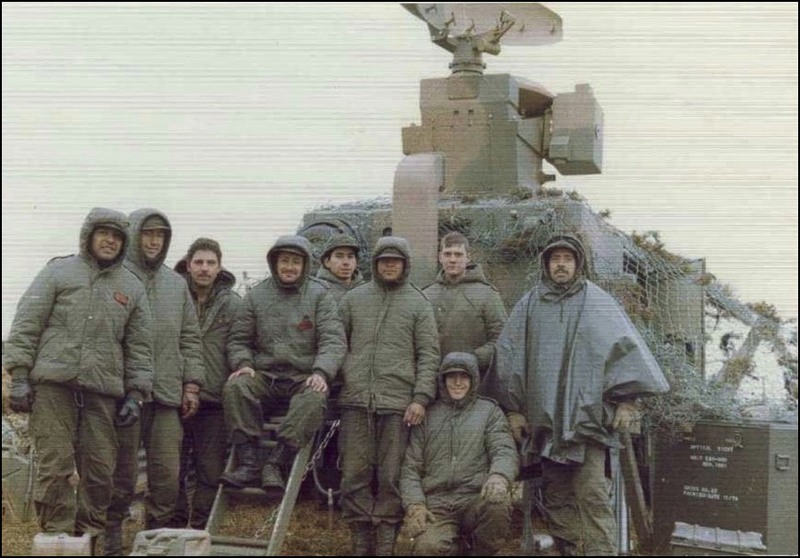 We already said that the antenna, the target of the missile, was 70 meters from the operators’ cabin where the staff was located; and about 10 metres from this cabin was the accommodation for the soldiers and the technicians. Building No 3 was about 50 metres from the soldiers' building; and next to this, and about 10 metres further towards the sea, was a fourth building that was uninhabited. protect it. The Chief agreed and some of the men went with the landlady to help her rearrange the house. In the afternoon the Chief appointed two non-commissioned officers to sleep in the house that night but, while they were dining, a thought came to him from above: what would happen if, in the middle of the night, I had to recall these two NCOs for any reason? Although army soldiers had been accustomed to seeing Air Force personnel, moving at night was still potentially dangerous in case they opened fire. More so in this case, because fighter controllers would not be expected to be in that house. with thoughts about him and his ancestors. But God was looking down on the whole scene. As can be seen in the following transcription, at dawn on the 31st and earlier than usual, Harrier sorties were flown to bomb the airport. These flights were the bait that the British laid to make sure the radar was not silent, on the one hand, and on the other hand to distract the fighter controllers forcing them to concentrate on flights with very short notice. 1) Azimuth 198° [24 km]. 2) Azimuth 080° [37 km]. 04:16 hrs. An echo appears in the Azimuth 094° [194 km]. Velocity [555 km/h]. 04:40 hrs. Is cut high, the echo in the Azimuth 091° [27 km]. 04:43 hrs. A bomb falls on the airport. 05:10 hrs. With high SVC NML [Normal operation]. 05:12 hrs. There appeared 1 Section Harrier AZ 090° Distance [190 km]. 05:45 hrs. There appeared two Harriers. One Azimuth 090° [190 km] and the other Azimuth 010° [59 km]. The Harrier that came from the [x] went vertical and dropped 2 Bombs on the airport, then exited by the radial 320°. The one that came from the Azimuth 010° vertical step to the airfield and exited by the radial 090° with heading 090o. The Harrier that went out by AZ 320o made a left turn with heading 130°. For the [20 km], we were lost and for 2 minutes we are attacked (the radar) with two missiles. Consequences: radar out of service. Horns pierced by shrapnel. Cross-sectional signal cable severed between technical cabin and OPS [Operators’ cabin]. Personal = S/N. 1° Ten. Faber, Alf. Mercau, C.1° Eganas, C.P. Rosset, C.P. Barrios, C 1o Ulrich. 07:30 hrs. The Army radar starts to operate. Translation: ‘Consequences: Radar out of service. Horns pierced by shrapnel. Cross-sectional signal cable severed between technical cabin and operators’ cabin’. 21:00 hrs. Radar [The TPS-43] in limited poor service. Screen with sectors not updated, no height. It has only normal video processing. 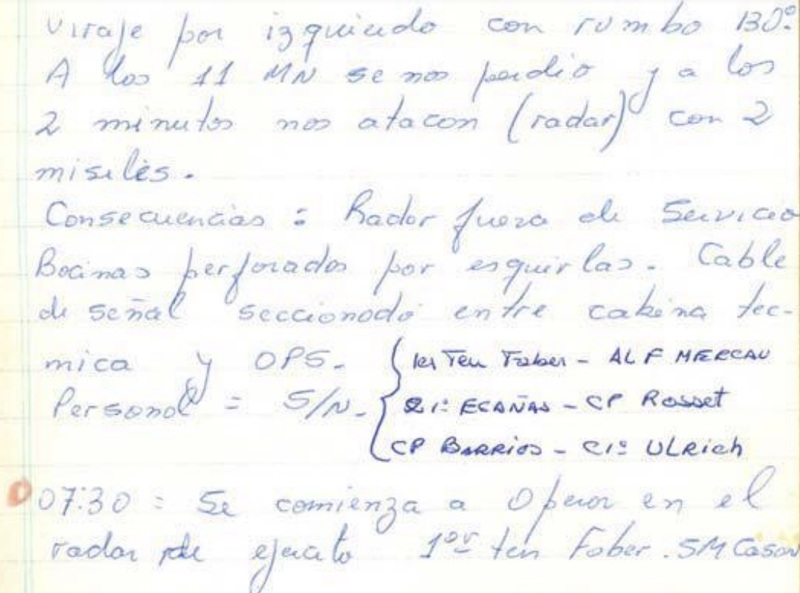 The log for 04:40 hrs shows that the fighter controllers were already concerned that they could be attacked with an anti-radiation missile but the bait was already working; concerned as to why the Harriers were flying so early and tying the airport up, they did not pay much attention to long-distance radar returns, and when they realised that one of the echoes was a threat, they assumed it was another Harrier; but actually it was the Vulcan 20 km from the radar and heading straight for him, but it was too late. While they were trying to react to the threat, the Vulcan had launched its missiles. Most likely the Vulcan had been taken to be a Harrier echo on the radial 010° and 59 km, which about 15 minutes earlier had been seen about 300 km on the radial 030 for a few rotations of the antenna, and that the operator then confused it with the other Harrier, the one that came from the 090° azimuth and dropped the bombs, as it entered the zone of fixed echoes where it would be masked. missiles, which matches the description in the radar’s log. These turns were due to the radar cutting off its emissions, forcing the Vulcan to go back out and take some distance to restart the process; at the last of these turns, the one that won was the Vulcan. The Vulcan had fired two Shrikes, one of them fell about 8 to 10 meters from the antenna, and most of its shrapnel was absorbed by a truck that was positioned between the missile and the antenna; only two pieces of shrapnel reached the waveguides of the horn, causing the dry air to escape under pressure resulting in the radar becoming unserviceable; another piece of shrapnel cut through the signal cable that joined the technicians’ cabin to the operators’ cabin. The other missile fell between the accommodation building for the soldiers and Building No 3. But God, as we said, was watching over the scene, as he ensured nothing happened and everything became just a scare. Impact Points (blue circles) of the two Shrikes on Black Buck 5 with their approach direction (green arrows). We have just described what happened to the radar; once recovered from the shock and having verified the damage, the controllers asked the mainland for a replacement horn and the signal cable that had been cut through and, the next day, they sent replacement parts in the first C-130 that flew out to the islands. 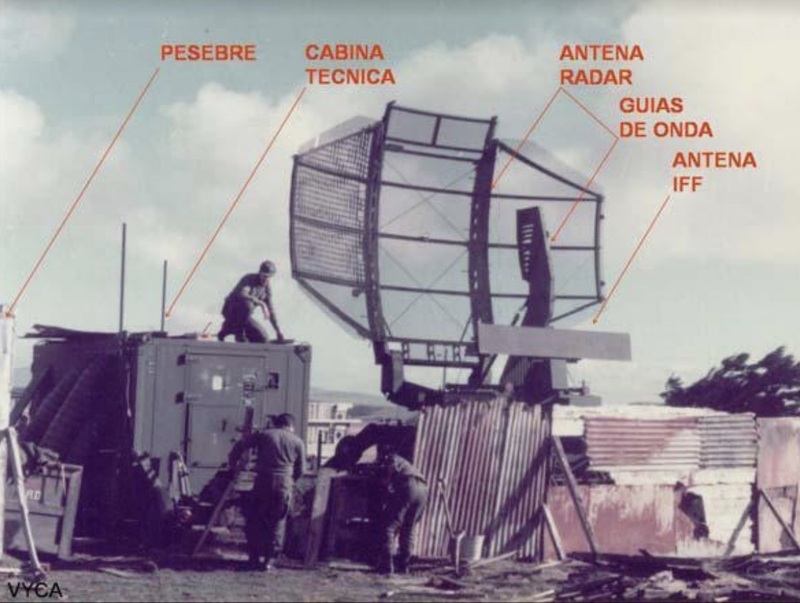 The radar, although battered and bloodied, as shown at the end of the log’s transcription, was then back in service. As for the staff, the two soldiers who were on patrol had just entered a recess by the fortification for the operators’ cabin, which served as protection and where they could also heat themselves next to one of the paraffin stoves while maintaining watch. 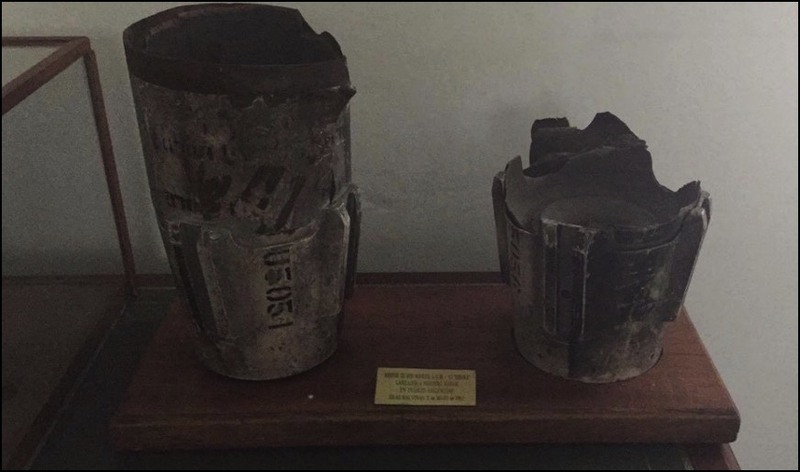 The three technicians who were also on patrol were just entering the operations cabin with coffee and hot water; as they finished entering a shock wave from the second missile slammed the door closed behind them, and a stray piece of shrapnel left its mark. Parts of shrapnel from this second missile also went through the building (which was made of wood) that was going to be taken care of by the two NCOs, passing at the same height as the beds. It goes without saying that after seeing the damage, these men completely changed their opinion of the Chief and his ancestors that they had made the night before. Of course, the blast and shock wave played havoc, both in the building for the soldiers and technicians and also for Building No 3, with flying glass, burst water pipes and crumbling walls, but no one came out of it with even a single scratch. Actually, there was one wounded man. After the explosions, amid the darkness and the smell of gunpowder, the Chief wanted to know if anyone had been injured, so he ordered all his men to get together in Montana House. Here though Murphy intervened with one of his laws because they could not get a flashlight that worked to enable them to read the personnel list [roster]. While they were doing this one of the operations officers approached the Chief and said: “Sir, I think I'm wounded”. Amid the prevailing darkness, the chief touched his back and it felt wet and hot: wet and hot meant blood, but the operations officer told him it did not hurt. They eventually got a flashlight that worked, looked at the wound, and realised what had happened. The moment they felt the explosion, when the technicians were entering the cabin, everyone without hesitation had been thrown to the ground, and along with them was the thermos with the hot water for coffee, which spilled onto the back of the ‘wounded’ officer. as a dining room, and which also became the residence for the shifts. The Vulcan fired the missiles from the northwest. 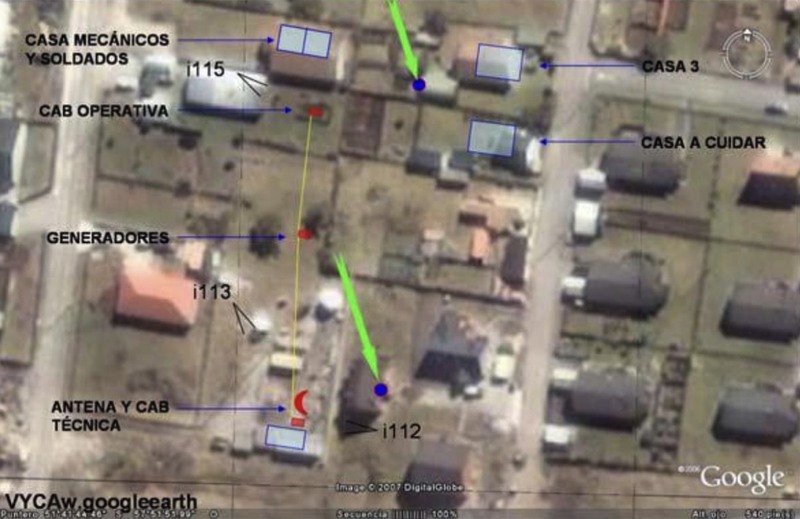 If the missile that struck between the soldiers’ accommodation and Building No 3 had impacted a little more to the right or left, those who were in one building or the other would have been injured. The missile blew the windows out and some shrapnel splintered through the buildings, but neither glass nor shrapnel wounded anyone. If the missile that impacted 8 or 10 metres from the antenna had had a trajectory 3 or 4 metres lower, the place of impact would have been the soldiers’ accommodation or the operators’ cabin and this story would be fraught with pain, and most likely we would not have written this book. Thank you, my Lord. Although they [controllers] continued to operate from the muletto [forklift tracked vehicle] and the Cardion radar (TPS-44), they had to repair the radar [TPS-43] as soon as possible; there was also something else they had to do urgently: to warn their families that they were well. No doubt the attack on the radar was going to be news on the mainland, and someone given an audience would just add sensationalism, incorporating blood and morbidity, some dead or wounded; so the first thing they did was call their homes to tell their loved ones that no matter what they heard or saw on the news, everyone was fine. To do this they resorted to contacting amateur radio operators on the mainland, those who were permanently in communication, and of which we will later hear some stories. The fighter controllers learned that they would need to be more attentive to the surprises the British presented, particularly anything that was out of the ordinary or routine, such as the Harriers flying at 0400 hrs or 0500 hrs in the morning. Although partly destabilised and with problems, the TPS-43 was again on the air (emitting) 39 hours after being attacked by the Shrike, at 2100 hrs on June 1st, to be precise. The British commenced planning for a further Vulcan mission with Shrike missiles, Black Buck 6, which took place in the early hours of June 3rd. The following transcript from the log corresponds to that event. 05:00 hrs. I take charge of the shift with normal video only being processed. 05:15 hrs. Echo appears in the Azimuth 030o A [322 km] at [463 km/h] for five rotations of antenna. 05:45 hrs. An echo is detected entering with Ro Convergent in the Azimuth 330 at 55 km. We followed him to the 17 km and turned it off. 06:50 hrs. Is now in SVC (Service) again after bombing at the airport. White is confirmed on a battery with radar. We detected raiders out on radial 033 degrees with same course until the 430 km. The controllers saw the Vulcan to be on the same track as the previous, this time it was detected at 174 nm (322 km) on the azimuth 030° and with a speed of 250 knots (463 km/h); too slow, as it was probably trying to conserve fuel. It disappeared after 5 rotations of the antenna (around 50 seconds). It was seen that it had scarcely grazed the lower [radar] lobe in its descent to low level, and then reappeared at 30 nm (55 km) on the Azimuth 330°. They [controllers] ‘cut high’ when it reached 17 km and started the game of ‘cat and mouse’, searching and locating both this and other flights, and shutting down every time he faced directly onto the radar. This continued for almost an hour, until the Vulcan finally launched a missile at an Army Skyguard battery and then climbed to height, where it could be followed to the edge of the screen, 430 km from the radar. This is the Vulcan that ended up landing in Brazil. The British made it clear that it was because it had trouble with its refuelling probe that broke, and the only place it could get to with the fuel remaining was Brazil. As we did above, let's do an analysis of what happened. The Vulcan went hunting again for the TPS-43 but the radar, ‘cutting’ and ‘giving high’ for short intervals, gave him no chance to launch the missile at them; finally, it reached its minimum fuel to be able to return and chose an alternative target, the Skyguard, to fire at before departing. If we compare the weapons systems of the Vulcan against Skyguard, the former had a missile that could be launched from 16 km, while the Skyguard only had [35 mm] guns with a range of 4 or 5 km. To be able to hit the Vulcan, it had to be as close as 4 or 5 km. The Vulcan had 11km, or in the worst case 7 or 8 km in its favour; it could launch against the Skyguard and depart without entering into the lethal envelope of the cannons. The Roland [SAM] could have been in a better position to counter the Shrike from the Vulcan. However, besides requiring the Vulcan to enter into its lethal envelope, the Roland would need to keep its tracking radar on during the entire flight of its missile as it needed that signal for [missile] guidance, thereby presenting opportunities to the Vulcan to fire also. Returning to the Skyguard, it could direct its cannons at the Vulcan by radar or by an optical television system. If it used radar it presented opportunities for the Vulcan to home in on the emissions and to fire the Shrike; if it did it optically, it would deny him that opportunity, while it could fire at the Vulcan, as long as it closed to 4 or 5 km. If the latter happened, the Skyguard would have been able to paint a Vulcan on the side of its (control) cabin. But at that [early] hour in the morning, we don't know if the operator of the Skyguard would have been able to see the Vulcan with its optical system. We don’t know what exactly happened, but the radar continued to transmit and therefore provided the guidance signal that was needed by the Shrike [to home in on]. Some reports say that the problem was that the Skyguard required authorisation [to engage] and did not have a veto. This we saw when we talked about the attack of May 1 and the fire control orders that were in place for Second Lieutenant Barri. They say that on this occasion the authorisation was slow in coming; others allege that the deputy Skyguard operator was regulating the transmission power of his search radar to tempt the Vulcan into making him believe that he was further away than he actually was, thereby enticing him into the envelope of his cannons. This we will never know because the Vulcan was the one who fired first, and it was he who painted a Skyguard [actually a Shrike missile] on his side, claiming the lives of four men.